A circular walk around the village of Youlgreave in the Derbyshire Peak District. The walk visits the popular Lathkill Dale using a section of the Limestone Way which runs past the village. There's riverside trails, woodland paths, some moderate climbs and great views over the Peak District. The walk starts on the River Bradford, just to the south of the village. Here you can pick up the Limestone Way and head west towards Middleton. 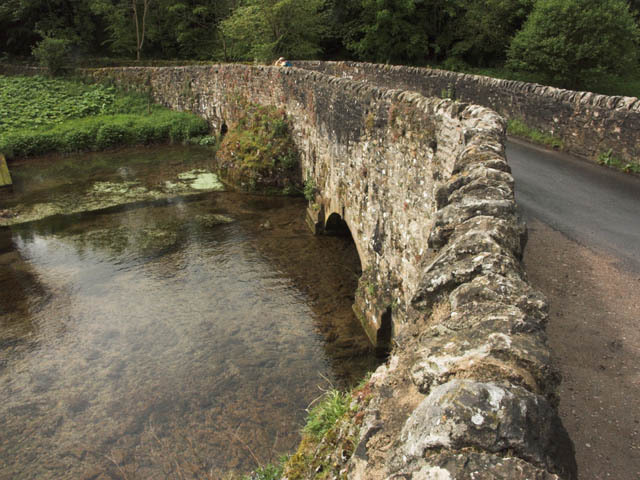 Just before you get to Middleton you cross the river and climb towards Lathkill Dale. The dale is one of the real highlights of the area with large limestone cliffs, peaceful woodland and pretty waterfalls. It's also great for wildlife with ducks, herons, wagtails, dippers, waterhens and coots to look out for on the water. The trail follows the River Lathkill round to Over Haddon. Near here you will pass the site of a deserted medieval village, Conksbury, on the south bank of the river. After crossing Conskbury Bridge you continue towards Alport, at the confluence of the River Bradford and the River Lathkill. Here you pick up the River Bradford again and follow it back into Youlgreave. To continue your walking in the Yougreave area you could head a few miles east and visit Stanton Moor. Here you can see four Bronze Age stone circles including the well known Nine Ladies. The settlements of Ashford in the Water and Bakewell are nearby. There's lots of fine trails to follow through the surrounding countryside. Also of interest is the Peak District Inn Way which passes the village. The long distance trail visit 53 traditional country pubs in the Peak District. Limestone Way - Travel through the beautiful Peak District National Park on this walk through Derbyshire and into Staffordshire. Stanton Moor - This upland area near the Derbyshire village of Stanon-in-Peak has good walking trails, attractive woodland and fascinating ancient historical sites to visit. Bradford Dale - This lovely riverside walk from Youlgreave takes you along the River Bradford before climbing above the village for some great views. Nine Ladies Stone Circle Walk - This walk visits the fascinating Bronze Age stone circle of the Nine Ladies in the Derbyshire Peak District.